Another view of the Plaza Hotel and Grand Army Plaza, taken from the corner of Fifth Avenue and 58th Street, around 1907-1910. Image courtesy of the Library of Congress, Detroit Publishing Company Collection. 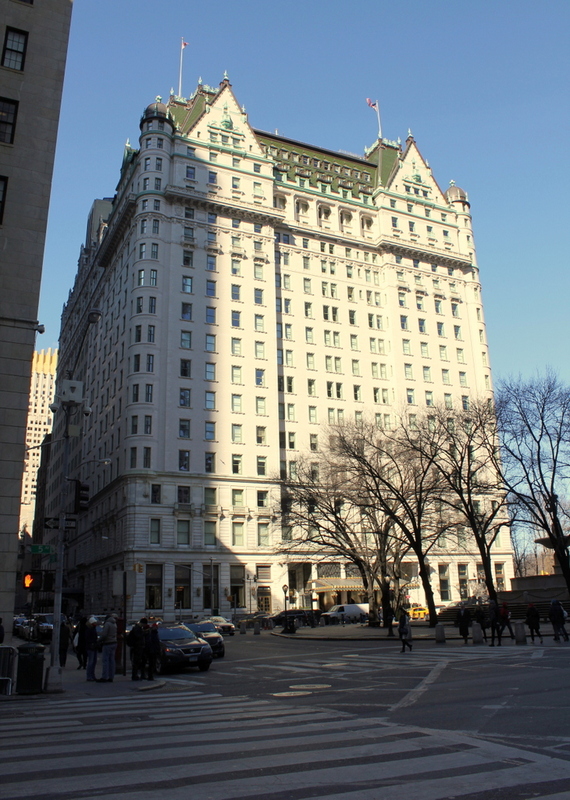 This view of the Plaza Hotel shows the building from the Fifth Avenue side, a block away from where the photos in the previous post were taken. As mentioned in that post, the hotel was built in 1907, on the site of an earlier, much smaller Plaza Hotel. It was built right next to Grand Army Plaza, which is seen in the foreground, and also next to the Cornelius Vanderbilt II House, whose wrought-iron fence and gates are visible on the far left. At first glance, the hotel appears to look the same in both photos, but the left side of the building is actually significantly longer. This was the result of a 300-room expansion along West 58th Street in 1920, which replaced many of the earlier low-rise buildings that appear in the first photo. 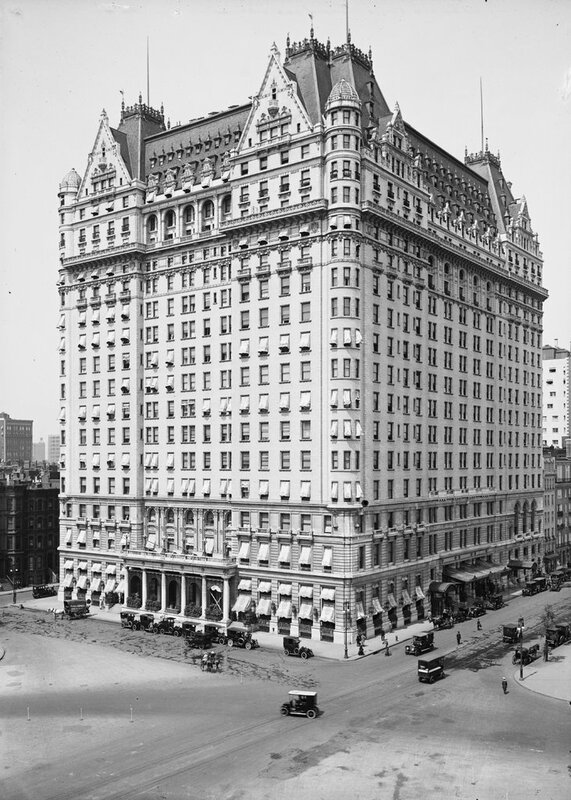 A few years later, in 1926, the nearby Vanderbilt House was demolished, and today the Plaza Hotel is the only surviving building from the first photo. 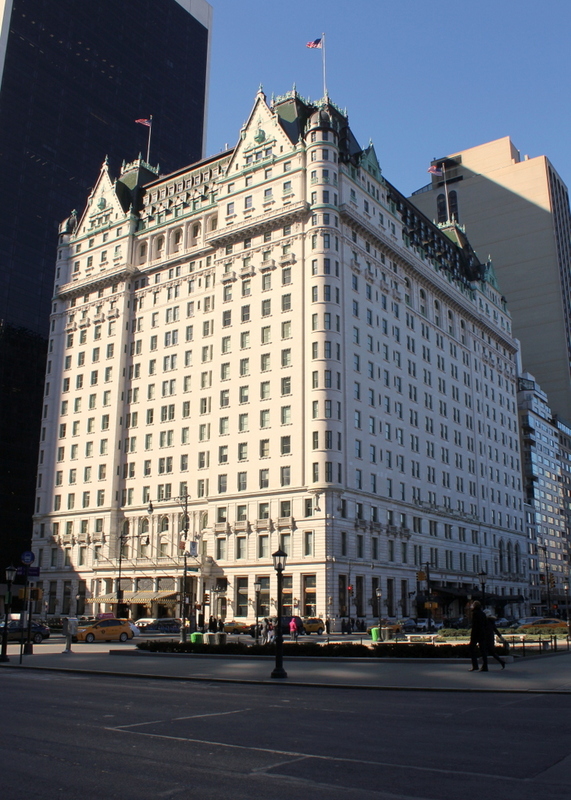 Aside from the addition, the hotel retains its original exterior appearance, and today it is one of two New York City hotels, along with the Waldorf-Astoria, to be listed as a National Historic Landmark. The Plaza Hotel at the corner of Fifth Avenue and West 59th Street, around 1907-1915. Image courtesy of the Library of Congress, Detroit Publishing Company Collection. New York’s Plaza Hotel is named for the Grand Army Plaza, which is located here at the southeast corner of Central Park. 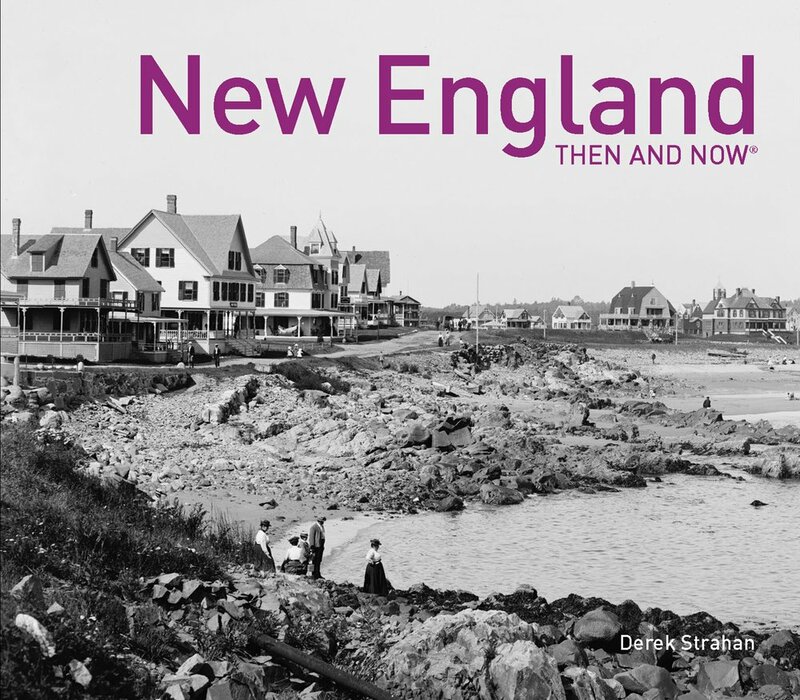 It has since become a prominent historic landmark, but when the first photo was taken it was virtually brand new. 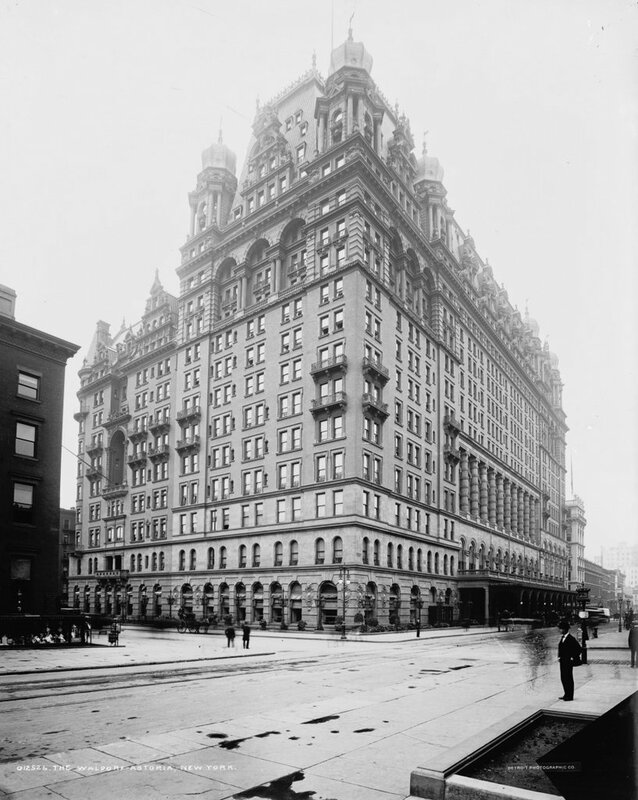 It replaced an earlier Plaza Hotel that had been completed in 1890. This eight-story building was damaged by a fire in 1902, and although it remained structurally sound, it was sold and demolished a few years later. 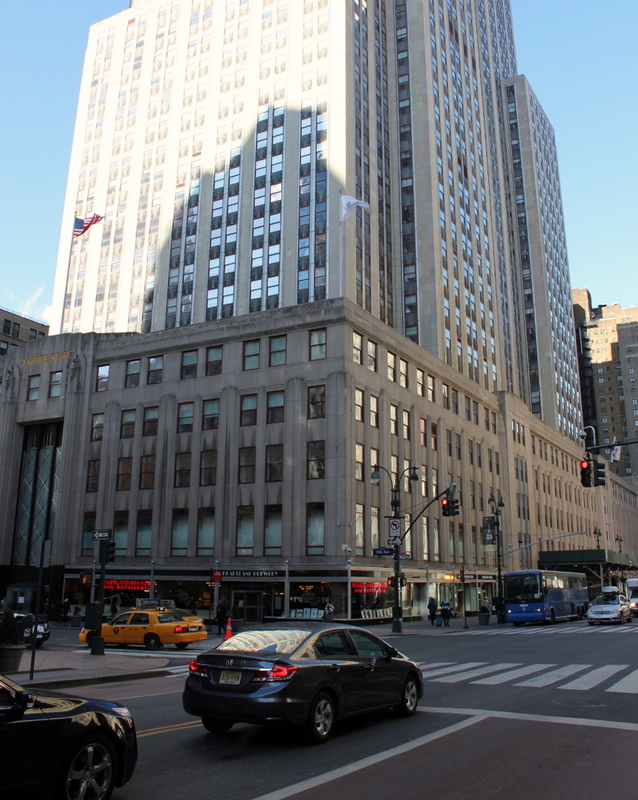 The new owner hired architect Henry J. Hardenbergh, whose previous commissions included the original Waldorf-Astoria Hotel. 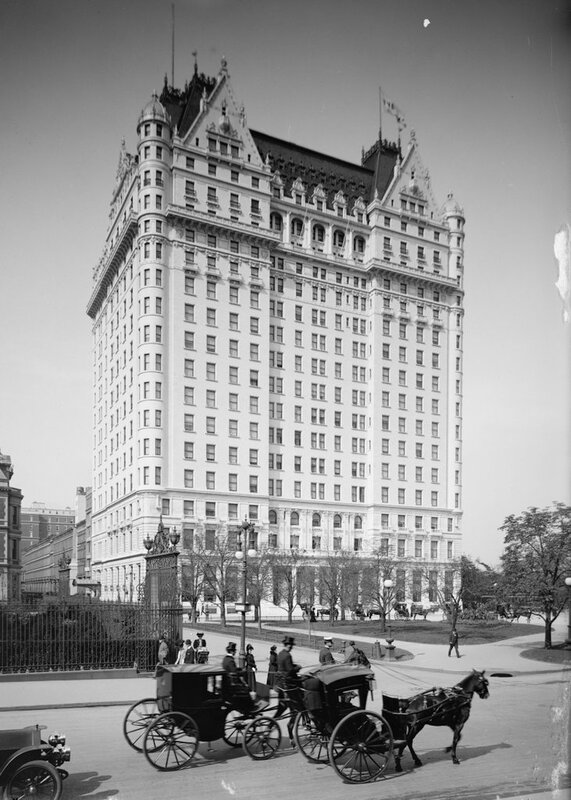 His design for the new Plaza Hotel was no less grand, and the 17-story hotel was completed in 1907 after two years of construction, at a cost of $12.5 million. Over the years, the hotel has seen plenty of wealthy, prominent guests, as well as some notable owners. Conrad Hilton, the founder of Hilton Hotels, purchased it in 1943 for $7.4 million and, after changing hands several more times, it was sold to Donald Trump in 1988 for $407.5 million. Since then, it has gone through several more ownership changes, and from 2005-2008 the century-old hotel was significantly remodeled. Many of the hotel rooms were converted into condominium units, selling for upwards of $10 million per unit. Today, instead of over 800 hotel rooms, it now has just 282 in addition to the 181 condominiums. However, on the exterior the hotel looks essentially the same as it did when the first photo was taken, and it is listed as a National Historic Landmark on the National Register of Historic Places. Looking south along Fifth Avenue toward the intersection of 34th Street, around 1904, with the Knickerbocker Trust Company building in the foreground and the Waldorf-Astoria Hotel beyond it. Image courtesy of the Library of Congress, Detroit Publishing Company Collection. The two buildings in the first photo, the Waldorf-Astoria and the Knickerbocker Trust Company Building, have been discussed in further detail in earlier posts, but this photo here provides a particularly good view of the architecture of the Knickerbocker building, which had been completed around that time. 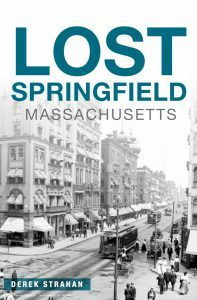 It was designed by McKim, Mead & White, a prominent architectural firm whose other significant works of the era included the Boston Public Library and New York’s Penn Station. 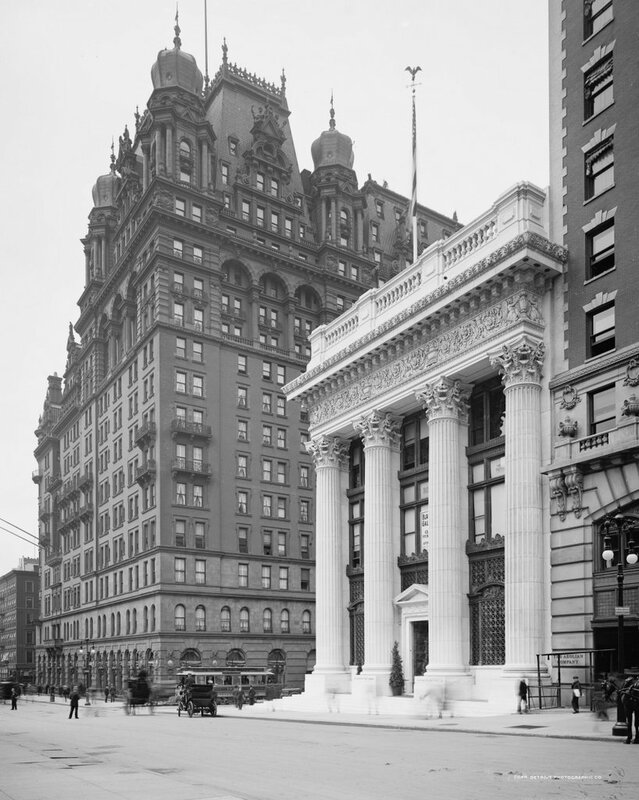 Unfortunately, although the bank building is technically still standing here, subsequent alterations have completely destroyed the original architecture, including the addition of 10 stories on top of it in 1921 and the replacement of the facade in 1958 with the bland exterior that it now has. As for the Waldorf-Astoria, it is obviously no longer standing; the famous hotel was demolished in 1929 and the Empire State Building was built in its place. The Waldorf-Astoria, at the corner of Fifth Avenue and 34th Street, around 1900. Image courtesy of the Library of Congress, Detroit Publishing Company Collection. The Waldorf-Astoria is one of the most famous hotels in New York City history, and it all began as a result of a feud within the Astor family, whose origins dated back to 1827, when William B. Astor, Sr. purchased a significant amount of property in present-day Midtown Manhattan, including a section of Fifth Avenue from 32nd Street to 35th Street. With a purchase price of $20,500 (about $433,000 today), this largely undeveloped land on the outskirts of the city turned out to be a wise investment, and Astor became the wealthiest man in America. 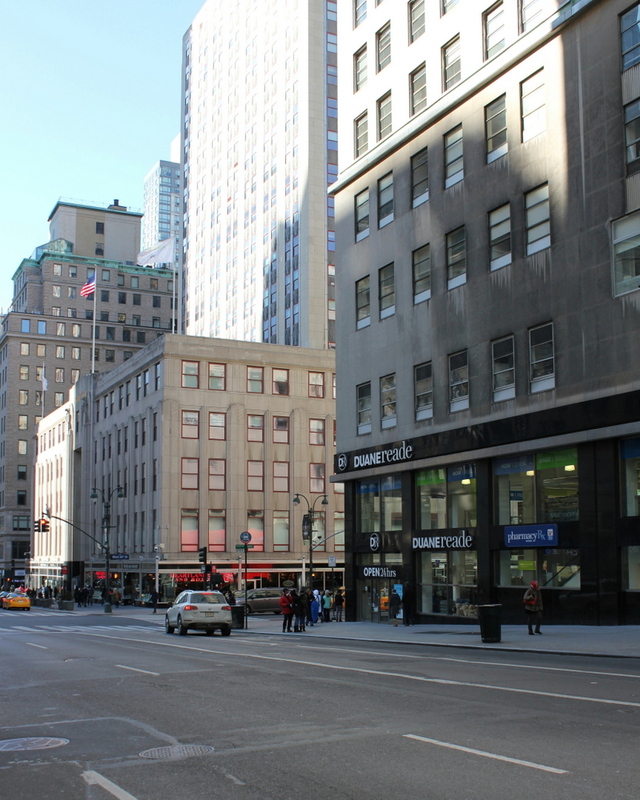 Here along Fifth Avenue, two of his sons split the block on the west side, with John Jacob Astor III and his wife Charlotte Augusta Gibbs living on the corner of 33rd Street, and William B. Astor, Jr. and his wife Charlotte Webster Schermerhorn at 34th Street. As explained in more detail on the Daytonian in Manhattan blog, a rivalry formed between their wives, which ultimately led to John’s son William Waldorf Astor demolishing his father’s house and building a large hotel, named the Waldorf Hotel, that overshadowed his aunt Charlotte’s house right next door. The noise and traffic generated by the hotel was, as desired, a significant nuisance in the previously residential neighborhood, and Charlotte soon moved out of the house. When Charlotte moved out, her son, John Jacob Astor IV, announced plans to build a competing hotel on the property, named the Astoria Hotel. It was designed by Henry J. Hardenbergh, the same architect responsible for the Waldorf, and by the time it was completed in 1897 the two sides of the family had agreed to consolidate the two into a single hotel, named the Waldorf-Astoria. The first photo here was taken soon after, and it shows the distinction between the earlier Waldorf Hotel on the left, with the significantly larger Astoria on the right. Together, they occupied much of the block, and with 1,300 rooms it was the largest hotel in the world at the time. Although he started the hotel, William Waldorf Astor did not remain in the United States. He moved to England and became a British subject, earning the title of 1st Viscount Astor in 1917, two years before his death at the age of 71. As for John Jacob Astor IV, he is probably best known today for having been the richest man aboard the Titanic when it sank in 1912. He had a net worth of around $87 million at the time (around $2 billion today), and he and his second wife Madeline had been returning from their honeymoon aboard the ship. Madeline and their unborn son survived the sinking, but Astor did not. Coincidentally, the hearings for the U.S. Senate inquiry into the disaster were subsequently held here at the hotel. In its heyday, the Waldorf-Astoria functioned not only as a high-end hotel, but also as a restaurant and event venue for the wealthy New Yorkers who lived nearby. However, by the 1920s the relatively new hotel was already showing its age. Its Victorian interior decor, while fashionable in the 1890s, was soon out of date. Making matters worse, most of New York’s upper class, including the Astor family themselves, had moved further uptown, to mansions in the vicinity of Central Park. This, combined with Prohibition’s ban on alcohol sales, hurt their dining rooms, which had once been one of the hotel’s most profitable business. The hotel closed in 1929, and two years later reopened in a new building further uptown on Park Avenue, where it still stands today. The original building here on Fifth Avenue was then demolished to clear the space for the Empire State Building, which was completed in 1931 after just over a year of construction.